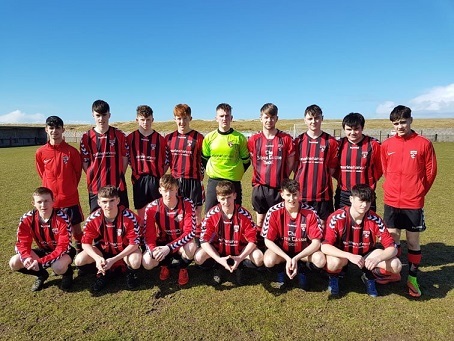 League leaders Fanad United can take another step towards securing the Donegal Youth League title when they play Dunfanaghy Youths on Wednesday night. The game at Traigh-a-Loch is a rearranged league fixture and kicks off at 6pm. Fanad need two wins from their final three games to win the league. On Wednesday night, they meet a Dunfanaghy side who have performed well in their first season in the Youth League. It promises to be an intriguing encounter and after being held at home by Bonagee on Saturday, Fanad will be hoping to get back to winning ways. Fanad United and Bonagee United Youths played out a scoreless draw at Traigh-a-Loch ‪on Saturday afternoon‬. Fanad started on the front foot and Darren McElwaine fired over after just 2 minutes. On 15 minutes the same player showed great skill to evade a number of challenges before seeing his shot fly over the bar. Eight minutes later McElwaine was at the heart of the action again when he headed over from a Paul Bradley corner. The best chance of the half fell to Bonagee in the 35th minute. When the impressive Aaron Wasson broke through the Fanad defence he was denied by an excellent save from Eoghan Jordan. Fanad came agonisingly close to opening the scoring 10 minutes into the second half. Ryan Toye showed superb skill in the box but his shot from a tight angle crashed off the crossbar and down onto the line. From the follow up, Darren McElwaine saw his header well saved by Cian Harkin. On the hour mark Jack Murphy hit a fine shot from outside the box but he was denied by a full length save by Eoghan Jordan. Fanad pressed in the closing stages and Conor McHugh and Jonah Serrinha had shots go over the bar. In the closing seconds Fanad had a penalty claim turned away when Darren McElwaine was caught by a high foot in the box. Fanad United who drew with Bonagee Utd. at the weekend.